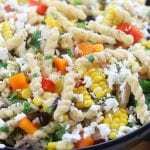 Southwest Pasta Salad recipe is like a clean eating version of Mexican street corn pasta salad. With fresh cooked corn, black beans and a creamy Greek yogurt dressing. This pasta salad is perfect for summer parties or dinners. Bring a large pot of water to boil over high heat for the pasta. Once boiling, heavily salt, add pasta and cook to al dente following the directions on the package. Meanwhile, in another medium-larger sized pan bring water to boil for ears of corn. Prepare a bowl with ice water. Once water is boiling add corn and cook for 5-6 mins. Once cooked, immediately add to ice water to stop the cooking process. Carefully cut corn off of the cob after it has cooled in ice water. Set aside. In large mixing bowl add yogurt and whisk in lime juice in increments. Stir in remaining dressing ingredients and refrigerate until needed. Add cooked noodles to dressing stir well. Add chicken, corn, black beans, bell peppers, onion and feta to noodle mixture. Stir well.